If you've never tried Goldenberries before, you're in for quite a treat. One of the world's most exotic fruits and the crown jewel of the Incan diet, these organic, sweet and tangy sun-dried berries are simply delicious and are a marvel with their high-protein seeds. More than just a tasty fruit, Goldenberries are bursting with phosphorous, bioflavonoids, and are rich in Vitamins C and A. Delicious right out of the bag, these powerful berries are fabulous in trail mixes, desserts, and a wide variety of recipes. Let the snacking begin! Goldenberries are also called cape gooseberries, agauaymanto berries or Incan berries, and where cultivated, they are called mullaca, uvilla, uchuva. The plant is an annual herb indigenous to many parts of the tropics, including the Amazon rainforest. It can be found on most continents in the tropics, including Africa, Asia, and the Americas. It grows up to one meter high, bears small, cream-colored flowers, and produces small, light yellowish-orange, edible fruit. The leaves of the plant have many ethnobotanical uses around the world. 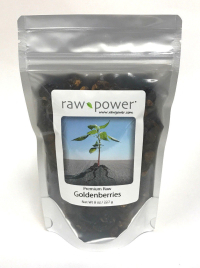 The goldenberry is one of the first plants to pioneer degraded areas. Its robustness and adaptability could lead to cultivation in many now unused marginal areas. The fruit is found in markets from Venezuela to Chile, and the plants have been grown on limited scale around the world in warm climates. Goldenberries are succulent golden fruits the size of marbles. They are protected by papery husks resembling Chinese lanterns. Currently in areas where they are grown, they are largely regarded as backyard fruits for children, but upscale European markets pay premium prices for them, dipping them in chocolate and to decorate pastries. They make excellent jams, which are popular in India and Africa. Dried, they make a delicious, tart, and highly nutritious and exotic "raisin." They are high in phosphorous, vitamins A, C, B1, B2, B6, and B12. They are also very high in protein (16%) for a fruit.